The proficiency level badges display what levels of cadet training you have currently completed (levels roughly equal years in the program). There is an eagle on the top of the badge, with a number of propellors below it, each representing one level (year) completed in the program. 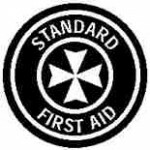 To get the Standard First Aid Badge, a cadet must first have completed the St. John Ambulance Standard First Aid Course. To get the Emergency First Aid Badge, a cadet must first have completed the St. John Ambulance Emergency Level First Aid Course. 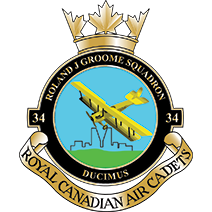 Once a course is completed, cadets must bring proof of completion to the squadron to get the badge. It is also possible to get the first aid training while on a instructor course (6 weeks, excluding GPS) for summer training.